This bake is a kind of hybrid (high bread?). 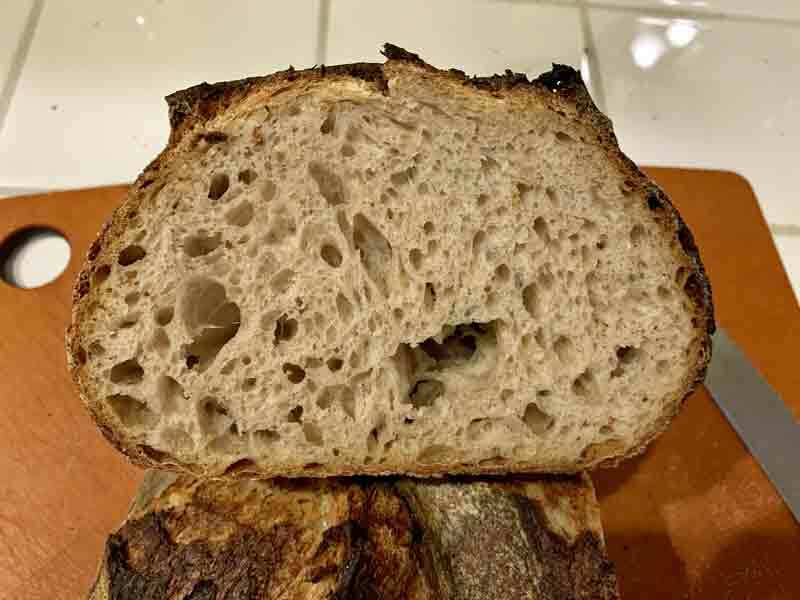 It utilizes elements of the formula and method shared by Mike Giraudo on Facebook, Peter Reinhart's James Beard Award-winning “San Francisco Sourdough,” as presented in his book, “Crust and Crumb” and various techniques I have adopted over the years, such as autolyse. The fermentations in a warm environment should enhance yeast and lactobacillus growth and production of lactic acid. The cold retardations and low hydration of the starter and the final dough should enhance acetic acid production. I am hoping the final result will be a moderately sour bread with a pleasing balance of flavors. Dissolve the starter in the water. Ferment at 76ºF for 8-10 hours. Refrigerate for 12 hours or up to 3 days. Place the flours and water in the bowl of a stand mixer and mix at low speed to a shaggy mass. Cover the bowl and let it rest (autolyse) for 1-2 hours. Sprinkle the salt over the surface of the dough. Add the starter in chunks. Mix at Speed 1 for 2 minutes to distribute ingredients then for about 9 minutes at Speed 2 to develop the dough. Transfer the dough to a lightly floured board. Shape into a ball. Transfer the dough to a clean, lightly oiled bowl. Cover the bowl and ferment at 80ºF for about 3 hours with stretch and folds at 50 and 100 minutes. Divide the dough into two equal pieces. Cover and let rest for 10-30 minutes to relax the gluten. Shape as boules or bâtards and place in floured bannetons. Cover or place in food-grade plastic bags. Proof for 2-3 hours at 80ºF until the loaves have expanded by about 50%. 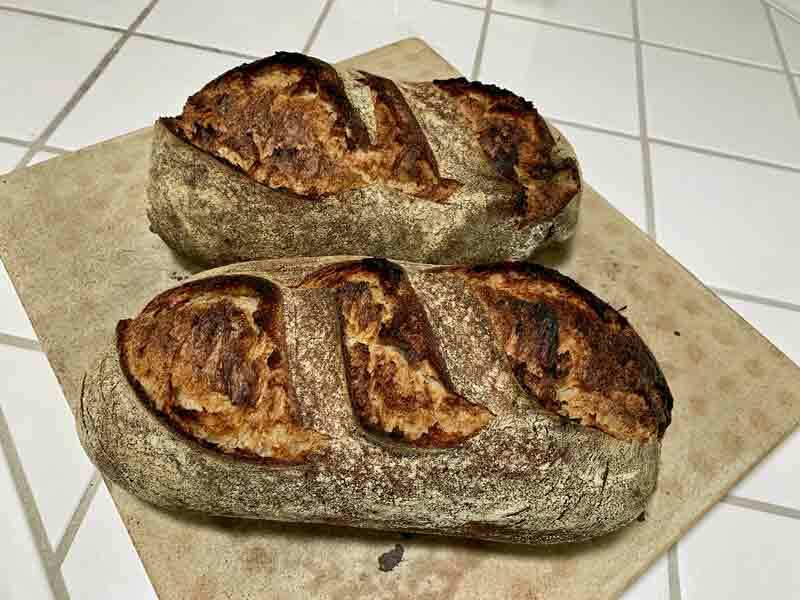 Refrigerate for 12-40 hours (The longer the cold retardation, the more sour the final loaf). Remove from refrigerator. Check on degree of proofing. Proof further at 80ºF, as needed. (May need 1-3 hours.) If adequately proofed, proceed to scoring and baking. I think I finally nailed it. The crust is super crunchy. The crumb is tender but chewy. The flavor has a decidedly sour flavor with lactic acid tones dominating. Except for the flavors attributable to the rye and whole wheat, I could convince myself this was a Parisian Bakery sourdough bread. on this thing of beauty! Enjoy every morsel. Thanks for the detailed write-up Dave. Sounds like you nailed it. The crumb looks perfect and I can almost taste it 😁. Which high protein flour did you use? Why the 3 day starter build? Sorry. I forgot to answer this question earlier. I used the "High-protein Bread Flour" from Breadtopia dot com. Sorry, David, it was too tempting. I told you I nailed it! But then I lost my head. Thanks....I wonder how goes about milling your own "High Protein" flour? I usually buy KAF high protein as Breadtopia shipping to NY charges are ridiculous. I only buy grain from them when I can't find it anywhere else like Durum. I wish I could taste those.. So let's say you feed your 50% starter on Monday 11:00 at let's say a 1:1:2 ratio and then let it ripe (I assume looking out for the dome with a few dimples) and then put it in the fridge. How did you know when to do the next feeding? 'Every other day' would this then mean let's say Wednesday at 11:00 and take it straight out of fridge and feed again? Does it need a specific inoculation? e.g. 20g, 20g, 40g or higher starter ratio? I assume you then take the 50% starter straight out of the fridge in order to build the final starter per-ferment that goes eventually into the dough? And again it will come straight from the fridge to be mixed? This seems worth doing just to see what the cycle time is for the refresh when the seed is always at refrigerator temperature. I am guessing that in might be most of a day if the weather is cool or perhaps as short as four or five hours if it is warm. David do you have a record of what your times were? Yes. I actually kept a written record, but the exact times of feedings varied according to my convenience. They occurred either around 9 am or around 1:30 pm. I did a 1:2:4 (starter:water:flour) feeding, making a total of 70g of starter each time. So, for the final starter, was able to use 60g as seed and keep 10k to seed the "mother." So, I didn't really do 3 "builds," in the sense of building up the starter volume in multiple steps. Nothing wrong with doing it in steps, but I found 70g a convenient amount to feed and keep going. After a feeding, I would ferment at room temperature for about 8 hours then refrigerate. Usually, I would let the starter warm at room temp. for a couple hours before a feeding. If I needed to feed right out of the fridge, I mixed with warm water. My feedings were every other day. The "old" starter minus the "seed" went into my discard jar, to end up as pancakes, crackers or whatever. Thanks David - always nice to have real data. And I strongly resonate with the convenience part. At 50% hydration you probably need to have it at room temperature to even get it to absorb the water. I also shall try to incorporate 25% rye/ww....there is a part of me where I think I should have one purely white and another with rye/ww and see how this affects the flavour profile? But I keep it simple and stick to David's excellent plan. I also will hand mix as I don't have a mixer. I suppose I should say first that this was an experiment. I should also say I regard it as a notable success, which makes me want to replicate it rather than mess with it. The choices I made were based on past experience and good advice and my no doubt less than perfect understanding of how sourdough bread works. So, my decision to go through several starter builds before using it in the final dough was based on 1) my experience years ago with Susan from San Diego's sourdough which involved 3 builds and resulted in one of the best sour sourdoughs I have ever baked, and 2) my guess that multiple builds at the same hydration and the same feeding cycle would stabilize the flora in the starter. The every other day feeding routine was entirely based on what Ramon Padilla (retired baker who had spent 30 years making my personal favorite San Francisco Sourdough) does at home. The refrigeration of the starter was based on a routine described by Peter Reinhart for his "San Francisco Sourdough" and should encourage acetic acid production. Now, I have over the years made many loaves using starter I converted from liquid to firm (or the reverse) in a single feeding. None were "bad," but none were exactly what I was after. Thus, my decision to maintain a firm starter for a while to see if that made a difference. And I am a firm believer in something I think Pat Roth used to say, quoting her anonymous "teacher," "Everything matters." Every decision was based on reasoning from theory and experience. It is surely possible that my reasoning was faulty at some points and my experience was misinterpreted at some points. But, hey! The bread is delicious. It is exactly what I was hoping for. It's even better - more sour and mellower - the morning after it was baked. I am reminded of the famous definition of insanity, attributed to Albert Einstein: "Doing something over and over and expecting a different result." The corollary might be: Doing something differently and expecting the same result. Just saying. Just now I was answering a question from another member in a SJSD thread from 2009, and there it was! A January, 2012 entry from an enthusiastic but somewhat bumbling baker who called himself "dabrownman." My, my. He's come a long way since then. I don’t care for sour bread but you are tempting me! Well done! This one might change your mind. Some sour bread is only sour. This is not as aggressively sour as Boudin and has a lot more going on than just sourness.